Among the three siblings of the G family, the Moto G4 Play is the most basic. You can buy the handset exclusively from Amazon.in for 8,999 INR. It flaunts a 5-inch (720x1280) IPS LCD display which offers a pixel density of 294 PPI. Moto G4 Play is powered by Snapdragon 410 Soc mated with Adreno 306 GPU, 1GB/2GB RAM, and 8GB/16GB internal storage memory. The handset uses a Removable 2,800 mAh battery to fuel its hardware. In terms of camera, it sports an 8 MP resolution (f/2.2 aperture) primary shooter aided by LED flash and a 5 MP (f/2.2 aperture) Selfie shooter. Moto G4 Play boots pure Android 6.0 (Marshmallow) out-of-the-box. Other basic features and connectivity option include Wi-Fi 802.11 b/g/n, Bluetooth 4.1, GLONASS, BDS, FM radio, NFC, and Turbocharging support. However, the handset misses out on a fingerprint sensor (a lot of rivals offer this sensor in this price segment). Moto G4 Play price in India is 8,999 INR, which sounds a bit high for a Snapdragon 410 powered handset in late 2016. The handset is available in India in Black and White colors. I bought this phone 4 week ago...this is my first smartphone, it is best phone in budget smartphone under 10,000 Rs. It's a very nice and decent phone. No hanging problem, Battery backup is very good. Camera is good. No heating problem. Screen also fine. Overall this is a great product from Motorola in a budget price. Im using this moto g play 4gen from 6 days. It's a very nice and decent phone. No hanging problem, Battery backup is very good. Camera is good. No heating problem. Screen also fine. 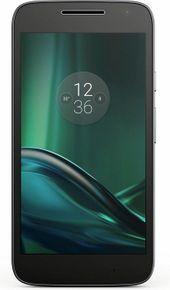 Overall this is a great product from Motorola in a budget price.